Care to see how you measure up to your favorite Rockets player? Want to see where your favorite artist prepares before a performance? If you are looking to walk beyond the velvet rope and into the fascinating world of Toyota Center, then we invite you down for the experience of a lifetime! Our exclusive one-hour Backstage Tour will take you behind the scenes of Houston’s premier destination for sports and entertainment. Contact us at 713.758.7715 or email [email protected]. 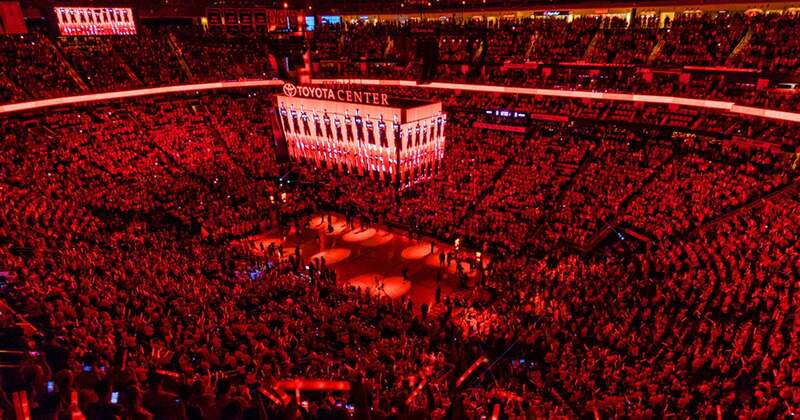 One of our friendly tour guides will lead you through our premium areas, offering you a special glimpse of the inner workings of Toyota Center. The Backstage Tour includes, but is not limited to Arena Floor, Legend Lockers, Rockets Club, Red & White Bistro, and Lexus Lounge. *Minimum tour group size is 10 people for all tours. Game Night Tour - $40 per person includes a ticket to the Rockets game that night. Tour with no game ticket - $15 per person. Cameras with lenses less than 4 inches in length are welcome in our building, but we ask you to respect the privacy of all coaches, players and employees while touring the arena. Video recording of any kind is not permitted. Tour schedule and highlights are subject to change without notice. Contact us today to book a Backstage Tour for your next family, school, business or organization outing!